The Loyola athletics department believes having diversity in its student-athletes, coaches and administrative staff is beneficial, according to Deputy Director of Athletics Jermaine Truax, but the Missouri Valley Conference (MVC) is one of the least diverse mid-major conferences in the Midwest. The Missouri Valley Conference (MVC) sponsors 4,279 student-athletes competing in 16 sports. In the 2016-17 academic year, 66 percent of those athletes were white, according to the NCAA demographics database. The Horizon League, Atlantic-10 (A10), Conference USA (CUSA) and the American Athletic Conference (AAC) are all similar to the MVC in location, size and tier. 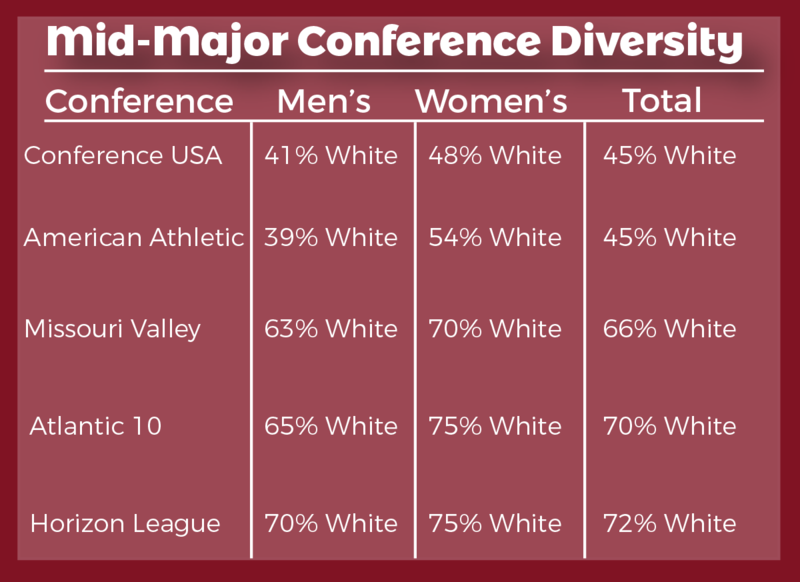 In comparison to those four other conferences, the MVC is the third least diverse. The AAC and CUSA tied for first with 45 percent white athletes, the A10 was fourth with 70 percent white athletes and the Horizon League was fifth with 72 percent white athletes. 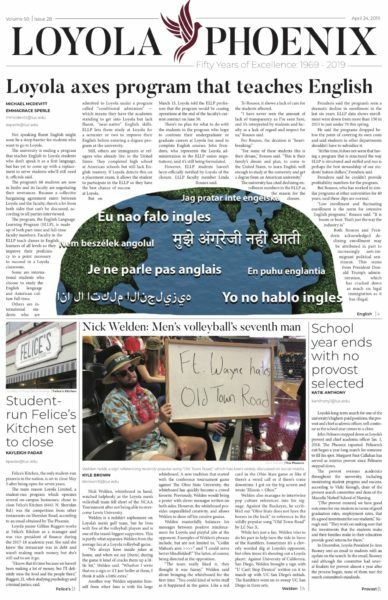 Loyola sponsors 13 Division I sports, six of which are some of the least diverse sports in the NCAA. In all of Division I athletics, women’s volleyball is 65 percent white, men’s volleyball is 70 percent white, softball is 70 percent white, women’s soccer is 70 percent white, men’s golf is 70 percent white and cross country is 70 percent white, according to the NCAA demographics database. The lack of diversity in men’s volleyball, as a sport, makes it difficult to recruit diverse players, but the Loyola men’s volleyball team tries to find players from different backgrounds, according to head coach Mark Hulse. Hulse said he finds the lack of diversity to be a result of the demographics of the top men’s volleyball players, whom Loyola recruits because of the success of its program. Loyola’s men’s volleyball team has been ranked nationally in 76 consecutive American Volleyball Coaches Association (AVCA) polls and won national championships in 2014 and 2015. The team is recruiting the highest level players in the country and, in men’s volleyball, according to Hulse, most of those players are white. Getting more minority athletes starts with hiring coaches and people in positions of power who are minorities, and the athletics department has been moving to get more diversity in its staff since Director of Athletics Steve Watson was hired in 2015, according to Truax. Loyola and the NCAA were unable to provide demographic numbers for specific universities. Being an athlete is all about learning to work with a team no matter where they come from or what they look like, according to women’s basketball head coach Kate Achter. The Loyola women’s basketball team is one of the most diverse teams at Loyola, but Achter said she believes she doesn’t have to promote diversity on her teams and that she recruits athletes based on skill level, not the color of players’ skin. Division I men’s basketball is 25 percent white, women’s basketball is 33 percent white and men’s and women’s track and field are both around 50 percent white, according to the NCAA demographics database. In the MVC, men’s basketball is 30 percent white, women’s basketball is 48 percent white and men’s and women’s track and field are 65 percent white, according to the database.